Captain Ben Wolfe of Sport Fish Michigan – AnglingBuzzTV fishing report for late May. Northern Michigan spring bass spawning season is creating outstanding fishing opportunities. Saginaw walleye fishing tips, and Lake Michigan lake trout and salmon update. Captain Ben Wolfe of Sport Fish Michigan – AnglingBuzzTV fishing report for early May 2018. Detroit River Walleye Run and Grand Traverse Bay Cisco and Lake Trout. The month of May is an excellent time take advantage of numerous fishing opportunities in Northern Michigan. Anglers throughout the area will be gearing up in hopes of kicking off the open water fishing season on our area inland lakes and surrounding Lake Michigan ports. The water temperatures are just starting to hit that magical 50-degree mark, filling the shallower water flats and steep breaks with baitfish and all the opportunistic predator fish that we love so much! 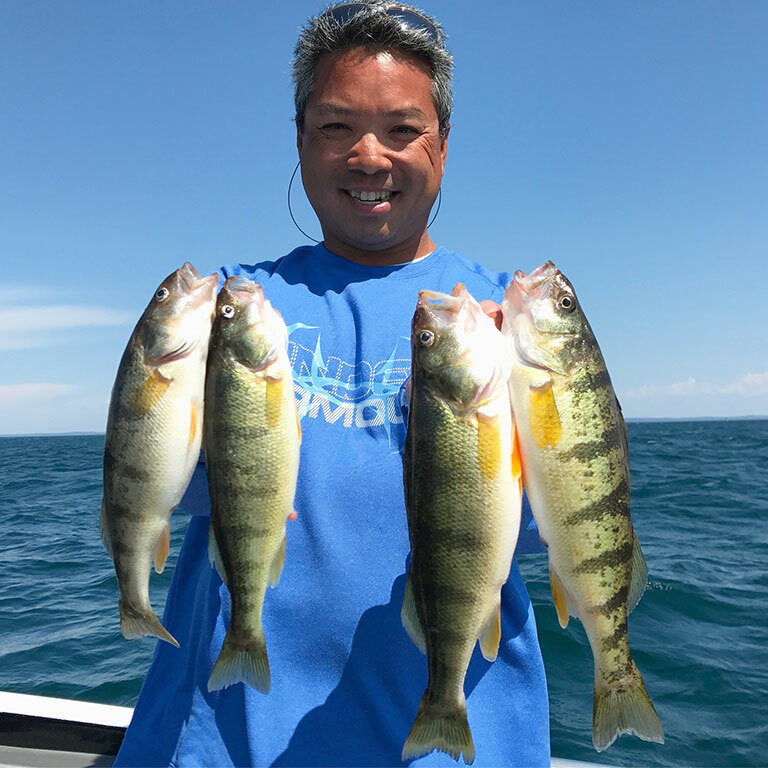 On Grand Traverse Bays, the perch fishing has really picked up pace in the last two months. Larger schools of perch can be found just off steep weed- and rock-covered drop-offs in 45-85 ft of water. Any flat in the depth range with a good weed, rock, or gravel bottom composition will also present as a great area to target the larger schools of perch. Anglers using perch spreaders, live bait, and even soft plastics will have no problem taking home good numbers of perch. In this same depth range, anglers will have the opportunity to jig and cast for cisco, white fish, and lake trout. This time of the year is the best time to get into all three of these species in a shallower water situation. Trolling, casting, and jigging are all great ways to capture huge catches of these fish. Everyone should get out to enjoy this awesome fishery. Anglers looking to take advantage of some spring brown trout action should definitely consider hitting the shallow water shoreline of Lake Michigan in the month of May. Ports like Manistee, Onekama, Arcadia, Frankfort and even Platte Bay will provide good numbers of brown trout on the right days. When in search of these acrobatic footballs, anglers will have good success finding areas where dirtier “stained” water presents. Finding areas with lower visibility and warmth are key when trolling or casting the shallows. Don’t be afraid to scout a shoreline for several miles in search of a temperature increase or color change in the water. Trolling with inline planer boards and fluorocarbon leaders seems to be effective for most anglers. Yozuri, Rapala, Bomber, and Challenger body baits work excellent for this application. Anglers will also not want to overlook the terrific walleye fishing our area inland lakes have to offer during the month of May. With cooler water temperatures and very limited weed growth, shallow water casting and trolling at this time is extremely effective. Low-light hours and even well into the darkness of night are great times to get on a hot bite. 4-15 ft of water just adjacent to drop-offs will most commonly hold feeding fish. Slow trolling and retrieving can be key in this situation. Quiet and stealthy is the name of the game! We at Sport Fish Michigan look forward to seeing you on water, good luck! We at Sport Fish Michigan look forward to seeing you on water, good luck! Captain Ben Wolfe of Sport Fish Michigan – AnglingBuzzTV fishing report for early May 2018. Detroit River Walleye Run.